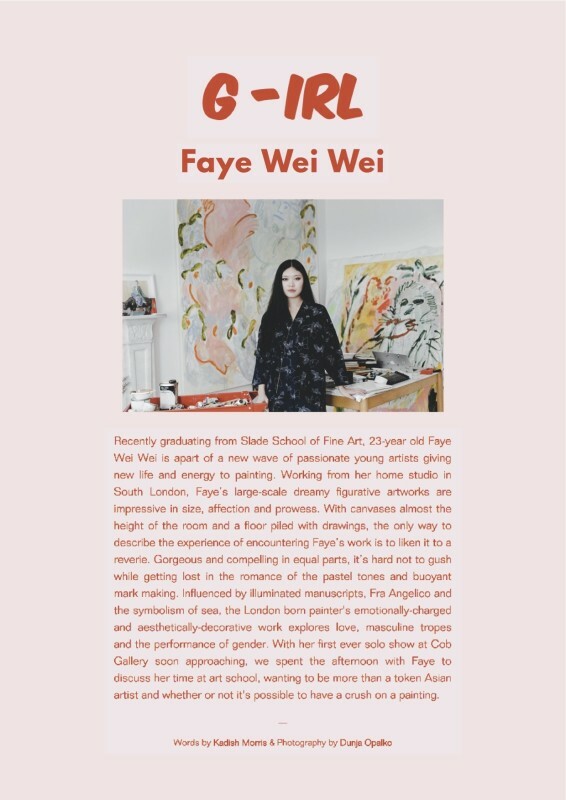 Recently graduating from Slade School of Fine Art, 23-year old Faye Wei Wei is apart of a new wave of passionate young artists giving new life and energy to painting. Working from her home studio in South London, Faye’s large-scale dreamy figurative artworks are impressive in size, affection and prowess. With canvases almost the height of the room and a floor piled with drawings, the only way to describe the experience of encountering Faye’s work is to liken it to a reverie. Gorgeous and compelling in equal parts, it’s hard not to gush while getting lost in the romance of the pastel tones and buoyant mark making. Influenced by illuminated manuscripts, Fra Angelico and the symbolism of sea, the London born painter's emotionally-charged and aesthetically-decorative work explores love, masculine tropes and the performance of gender. With her first ever solo show at Cob Gallery soon approaching, we spent the afternoon with Faye to discuss her time at art school, wanting to be more than a token Asian artist and whether or not it's possible to have a crush on a painting.